Scam Email of the day! The steady flow of scam emails continues as normal today, I’m sure you get many along these lines too. I thought it was worth pointing out a couple of the more obvious problems with this email – it becomes easier to spot the fakes once you know what to look for. Clue #1: Have a look at the sender address. It says “Microsoft” right? No. 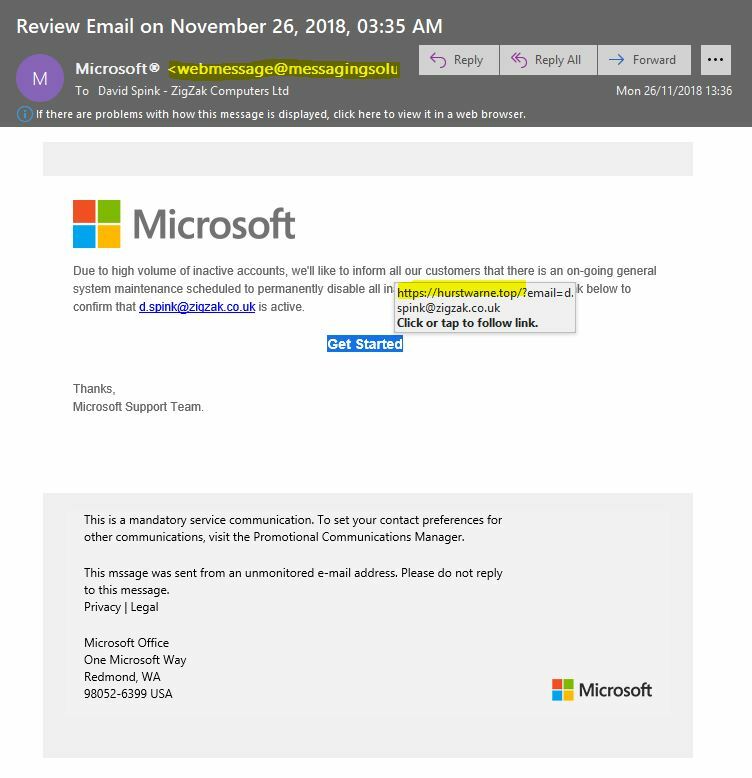 Only the start of the address is shown but it begins “webmessage@messagingsolu”, which definitely isn’t a Microsoft address. So already we need to be doubting the authenticity of this email. Clue #2: As is often the case the language in the email just isn’t quite right. It doesn’t really make sense. “Due to high volume of inactive accounts, we’ll like to inform all our customers” – what?? Clue #3: Biggest clue of all – if you hold your finger, or mouse pointer, over a link in an email the destination address will appear. If you look at what I’ve highlighted here the website address shows as “https://hurstwarne.top”. This is completely random and definitely not a Microsoft address! As always if you are unsure whether an email is genuine, or even if it looks genuine but seems unexpected, always just take a moment to consider it before clicking – if you click the link the chances are you’ll end up at an authentic looking website asking for your login credentials – which you’ll be handing straight to the crooks! The next version of Windows 10 is now available via Windows Update and direct download from Microsoft. As usual this is provided free of charge if you are already running any other version. We’ve seen Windows Update already automatically downloading it and installing on some machines – however if you’d prefer to take control of the update yourself visit the link below and just click the “Update Now” button, easy. There are a few new features in the update – although nothing especially worth writing home about for the average user. As with previous updates it’s really more of an evolution than a revolution these days, which is no bad thing. One thing we are promised is that you’ll be out out action for less time than with previous version updates (ie. watching the whirling circle of dots and a percentage slowly ticking up) as the update prepares more in the background, while your machine in still usable, than before. The traditional “Office” suite of apps such as Word, Excel, Outlook, etc, on a subscription basis. Benefits include installation of the apps to more than one device (subject to the type of subscription), the ability to move the subscription to new equipment, plus you also get new versions of the apps automatically. Online versions of the usual Office apps – accessible from any computer or tablet – and when combined with OneDrive offers fantastic collaboration features. A complete email/mailbox system called Exchange Online. Traditionally this type of email service would have required an on-site physical server and all the expense and maintenance that go along with that. Now you can have exactly the same features, maintained and updated by Microsoft, with 50GB mailboxes as standard, mailbox and diary sharing options, out-of-office, spam protection and a host of other features. It’s a fantastic programme, with a bewildering number of subscription options! Let us help you specify and configure exactly what you need. ZigZak Computers Ltd is a Microsoft Partner and we support our clients every day with Office 365. Finally, there’s even better news if your organisation is a registered charity – you get a discount on Office 365 subscriptions, including completely free mailbox options!